The Salvation Army of Jackson offers a variety of food assistance programs throughout the year to help fight hunger in our community. The Salvation Army's Emergency Food Pantry, the largest in Jackson County, annually provides nearly 5,000 households with food assistance. In partnership with local businesses, restaurants and individual donors, those in need receive nutritious food. We're proud to offer fresh fruits & vegetables, meats, dairy, and bread while supplementing with non-perishable items like peanut butter and whole grains. Friday- The Food Pantry is closed. On Wednesdays, The Salvation Army church hosts a Family Night. Dinner begins at 5:30 p.m. in the fellowship. All are welcome! Please contact Lt. Trisha Anderson at trisha_anderson@usc.salvationarmy.org for more information. Volunteers to help serve the meal are welcome. Please contact Heather Rodgers at heather_rodgers@usc.salvationarmy.org to schedule a date and time to help serve a meal. 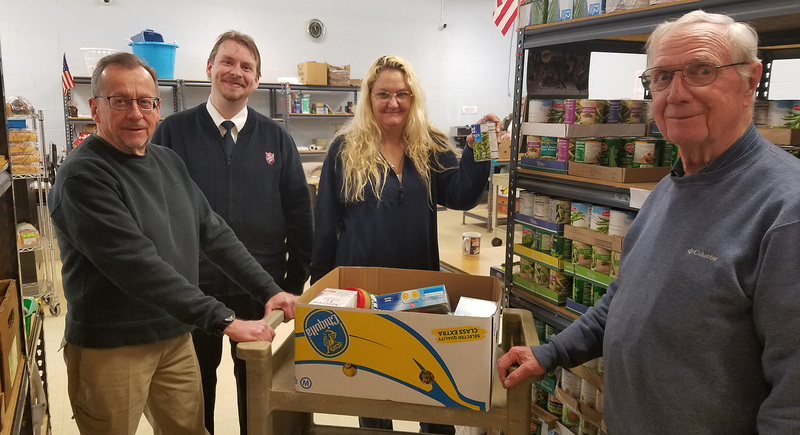 During the summer months of July- September The Salvation Army is a host site for the Food Bank of South Central Michigan's "Fresh Food Initiative." Every Monday starting in July from 8:30 a.m. - 10:00 a.m. our community is welcome to come receive an assortment of free fresh fruits & vegetables at our Community Center parking lot. Volunteers to help pass out the fresh food items are welcome. Contact Heather Rodgers at heather_rodgers@usc.salvationarmy.org or 517-782-7185 for more information about volunteering. Each Christmas season The Salvation Army provides anyone in need of a Christmas Food Box. The food box contains both perishable and non-perishable food items to supplement a Christmas dinner. Registering for a food box begins in November. Please contact us at 517-782-7185 for more information about our Christmas Assistance program.